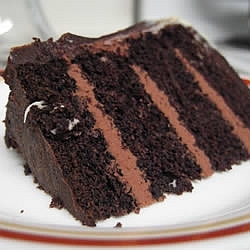 This chocolate layer cake recipe creates a gorgeous moist coffee-flavored chocolate cake that I made in cake layer pans (see below). This dark chocolate cake recipe is so versatile. In this recipe you could easily flavor the boiling liquid with juice, buttermilk or water instead of coffee. In medium bowl, pour the boiling coffee over the cocoa, and whisk until smooth; set aside to cool completely. Sift together flour, baking soda, baking powder and salt; set aside also. In a large bowl, cream shortening and sugar together until light and fluffy; approximately 3 minutes. Beat in eggs one at time, and beat thoroughly for 1 minute after each addition. Now stir in the vanilla. Add the flour mixture alternately with the cocoa mixture and alternate ending with the flour mixture. Spread batter evenly between the 3 prepared pans.